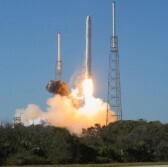 SpaceX completed a static fire test of a previously-flown Falcon 9 rocket booster Saturday at Cape Canaveral in Florida in preparation for the launch on Friday, June 29, of the Dragon spacecraft as part of the company’s 15th commercial resupply mission to the International Space Station, Spaceflight Now reported Saturday. The Dragon capsule will take off aboard Falcon 9 to deliver at least 5,900 pounds of crew supplies, research equipment and spare parts to the orbiting laboratory and is set to reach the ISS Monday, July 2. The spacecraft that initially took off in 2016 will carry to the ISS an instrument built by NASA’s Jet Propulsion Laboratory designed to measure the plants’ temperature in space as well as a spare of a latching end effector for the robotic arm. The launch will use the same first-stage booster that SpaceX deployed in April to bring the agency’s Transiting Exoplanet Survey Satellite into orbit. SpaceX conducted the test days after it won a potential two-year, $130 million contract to deliver into orbit the Air Force Space Command-52 satellite.